We all want to dictate our life. When I wake up on a Saturday morning and I don’t have any obligations, I can do whatever I want that day. I decide when and what I want to eat for breakfast. Do I want to play video games, read comics, attend a sporting or entertainment event, go to the farmers market, see my friends and play games? It does not matter what I do; what matters is that I have the freedom to make a decision. I want all people with Intellectual and Developmental Disabilities have the same freedom I do. Sadly many do not. I received DDA services for the first 25 years of my life. I can’t tell you what services I received, and unfortunately, neither can my parents. While talking with them about writing this article, they remembered that at one point my OT/PT therapy was covered, and then it wasn’t. It became very confusing from there, to the point of not receiving any DDA services. (I am currently on the no paid caseload). I wonder what my life would be like now if I were still in the system. Would I have as many choices and the ability to make decisions about the services I receive? 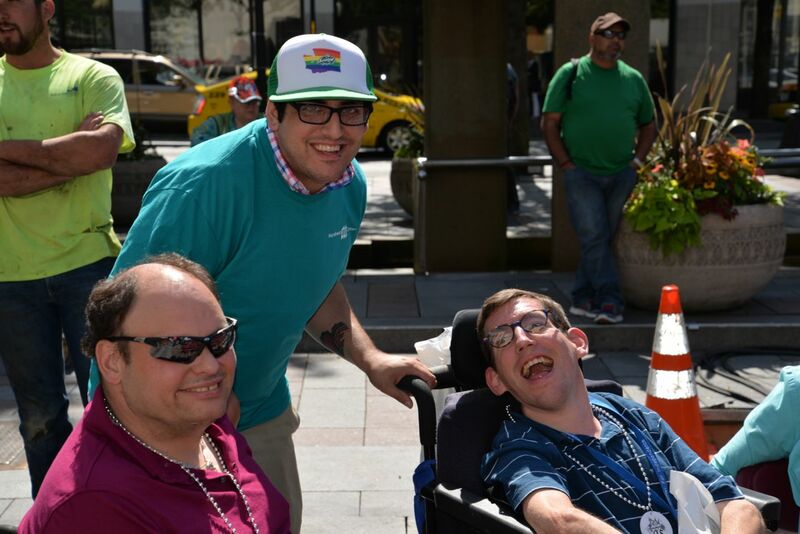 Noah (center) at ADA rally with colleagues Mike Rogers (left) and Shawn Latham (right). July 2015. In my job as a Self Advocacy Coordinator for groups involved in shaping public policies, I often hear stories about a lack of support to live without barriers, and to make decisions about what their supports look like. For some people, like myself, barriers can be addressed with physical accommodations. If I were not able to afford my current supports (iPhone, van with adaptive equipment to drive, network of allies), I would not have the freedom that I currently enjoy on my Saturday mornings. I think there are many people with Intellectual and Developmental disabilities that are in need of access to those types of supports. For others, the supports come in the form of another person. It could be someone driving them to meetings, or someone reading to them at the grocery store and keeping their budget in order. Support can look very different, depending on the person. 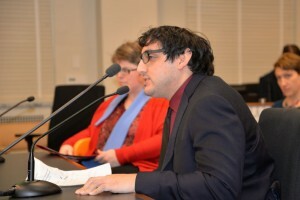 Noah testifying at a state House hearing on the ABLE Act. January 2016. Disability is a natural part of human life that affects people differently, and yet people with disabilities often get treated as though one size fits all. Often, that “one size” strips people of the freedom to make choices based on their individual needs, preferences, and identity. 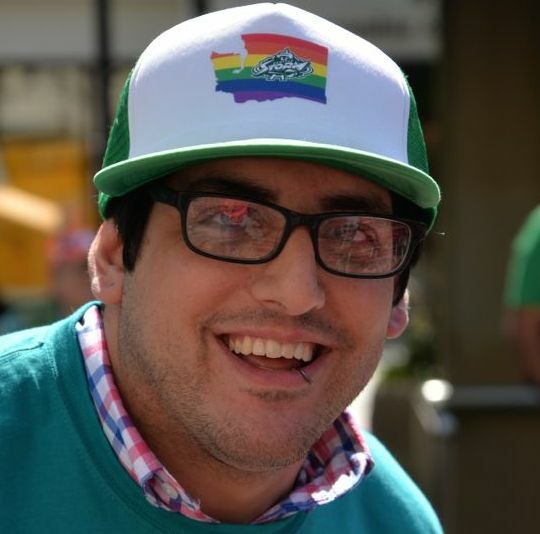 I advocate for promoting Self-Determination so that individuals with Intellectual and Developmental Disabilities have the ability and opportunity to exercise control over services, supports, and other assistance. Our goal should be working with as many people as possible to explore the capability for them to utilize their wants and needs in order to live a life of freedom. We should use the concept of dignity of risk, and focus on looking for options that would let individuals decide what is needed for their lives. There needs to be a system that is easy to follow for people to get the support they need, supports that are accessible for non-English speaking individuals, working class people, folks with limited education, and anyone who has been excluded from receiving services in the past. The system needs to be changed to allow for choice, and to promote self-determination in any way the individual sees fit. In the coming months, Self Advocates in Leadership plans to address this issue by working with partners to have a work group to discuss what self-determined services could look like. I hope it will be the beginning of a shift in the power imbalance that currently exists in our service system. It’s been a long time coming, but one thing I know is this: good things might come to those who wait, but change will come when people advocate.